(1) International negotiation has been held with the aim to agree on a post-2020 international framework which would be applied to all countries at the 21st Conference of the Parties to the United Nations Framework Convention on Climate Change (COP21). Parties are invited to submit their Intended Nationally Determined Contributions (INDC), which includes their national targets, prior to COP21. (2) The Joint Experts' Meeting, established under the Central Environment Council and the Industrial Structure Council last October, has initiated deliberations towards formulating Japan's INDC. Prime Minister Shinzo Abe also stated in his administrative policy speech that the Government would compile a future energy mix based on considerations of "S+3E's" (safety, energy security, economic efficiency and environmental suitability), and set up new emission reduction target with a detailed action plan at the earliest time possible. Japan's INDC will affect peoples' lives and corporate activities for the next ten-odd years, and therefore bears great significance. (3) Keidanren will take this opportunity to make a new proposal for not only the post-2020 framework and Japan's INDC, but also for the optimal climate change policy and Japan's contributions on a global scale and from medium- to long-term perspective. In order to resolve climate change, which is commonly faced by all humanity, we must engage in reducing greenhouse gas emissions on a global scale from a medium- to long-term perspective. In order to reduce GHG emissions and resolve climate change while eradicating poverty and achieving economic growth, we must maximize the use of energy-saving, low-carbon technologies and products. At the same time, we should engage in developing and disseminating innovative technologies that will enable significant emission reductions in the future. In order to pave the way to realize the roadmap above, the post-2020 international framework to be agreed at COP21 must be fair and effective, with the participation of all major economies. To ensure this, each country must be able to set up their targets by themselves. Moreover, in order to ensure the responsible participation of each country and the effectiveness of their efforts, given the fact that some emerging economies' per capita greenhouse gas (GHG) emissions level have surpassed Japan's, a common international review should be conducted among developed countries, emerging countries and developing countries. In addition, to avoid carbon leakage and achieve equal footing, it will be important to ensure the international equity of abatement costs through conducting reviews. Moreover, review should be conducted in multidimensional approach employing various indices, including marginal abatement costs, energy efficiency levels, and the application status of best available technologies (BAT) by each sector. In order to establish a substantial basis for international reviews, it will also be important to have each country enhance and disclose information related to domestic emissions, national targets, policy measures and their effects. Furthermore, at international review, not only domestic emission reductions, but also contributions to emission reduction in other countries, or efforts made towards the development of innovative technologies, should be evaluated properly. This will serve to stimulate international competition to disseminate and develop energy-saving and low-carbon technologies and products. In the international debate on the post-2020 framework, some advocate that carbon pricing is a cost-effective approach#1. However, such measures are likely to erode financial resources that could otherwise be used for research and development and hinder the development of innovative technologies that will enable significant reductions. The Fifth Assessment Report of the Intergovernmental Panel on Climate Change (IPCC) concludes that the effects of carbon pricing have been diversified depending on national circumstances and policy design#2, and specific approach should not be highlighted in an international agreement. The Japanese government must make a concerted effort to establish a truly effective international framework described above. Moreover, it is important to scrutinize the targets set up by other countries and contribute to ensuring their effectiveness and international equity, and to provide them with examples of concrete emission reduction measures, including Japan's technologies, products and knowhow. First, Japan must a) make maximum efforts to reduce domestic emissions, taking costs into consideration. 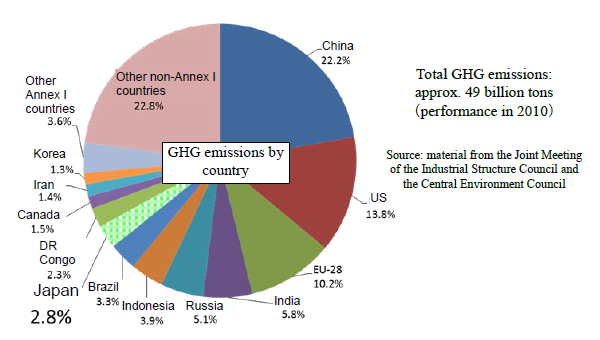 However, Japan accounts for only 2.8 percent of the world's GHG emissions. In order to maximize the contribution to the resolute global warming, Japan should draw on its technological strengths and engage in b) disseminating the world's top-class energy-saving and low-carbon technologies, products and knowhow overseas and c) developing innovative technologies. Therefore, the Japanese government should explicitly state its intention to promote emission reduction on a global scale, by compiling a package of measures that include not only its INDC, which aims to reduce domestic emissions, but also its contribution to reducing overseas emissions and developing innovative technologies. In January 2015, Keidanren announced its vision in "Toward the Creation of a More Affluent and Vibrant Japan — Innovation & Globalization —", which states that it will play an active role in overcoming environmental restrictions, etc. on a global scale. As for global warming issues, we launched the Keidanren Action Plan on the Environment in 1997. In 2013, we launched Phase I of the Keidanren's Commitment to a Low Carbon Society, under which goals are set towards 2020. We has just compiled Phase II of the Keidanren's Commitment to a Low Carbon Society, targeted towards 2030. Keidanren is determined to engage in global warming countermeasures proactively and aggressively in accordance with the four key pillars, namely: 1) establishing reduction targets for CO2 emissions from domestic business operations; 2) strengthened co-operation with consumers, customers, and other interested groups; 3) contribution at the international level, including technology transfer to developing countries; and 4) development of innovative technologies. We expect the Japanese Government to promote the dissemination of Japan's energy-saving and low-carbon technologies, products and knowhow overseas, and thus encourage the Japanese business community to make global contributions. Therefore, it should promote sectoral international cooperation through the Global Superior Energy Performance Partnership (GSEP) and Innovation for Cool Earth (ICEF). In addition, the Government should utilize mechanisms such as ODA, the Japan Bank for International Cooperation (JBIC)'s Global action for Reconciling Economic growth and ENvironmental preservation (GREEN), and the Bilateral Offset Mechanism to transfer such technology as energy-saving manufacturing processes, or disseminate low-carbon products, high-efficiency thermal power plants, nuclear power plants and renewable energy technologies. In addition, it is important to measure the emission reduction achieved through such efforts and appealing to the international community that Japan has contributed on a global scale. Furthermore, technologies and products featuring high environmental performance generally require high costs, which is an obstacle to international dissemination. Therefore, it is important to link the Climate Technology Center and Network (CTCN), which seeks to promote the transfer of climate technologies, and the Global Climate Fund (GCF), which supports mitigation and adaptation projects in developing countries. The Japanese government should become proactively involved in designing the scheme to ensure the effective operation and collaboration of both mechanisms and it should thoroughly monitoring their performance in order to ensure that the funds that Japan has contributed are effectively used. It would also be effective to implement measures regarding fluorocarbons#3, which are GHGs that have yet been excluded from climate change negotiations despite their high global warming potential. We hope that the Government will provide support for the establishment of institutional infrastructure in developing countries, so that Japan can contribute to the reduction of emissions in developing countries by offering technologies and knowhow related to the recovery, destruction and recycling of fluorocarbons. 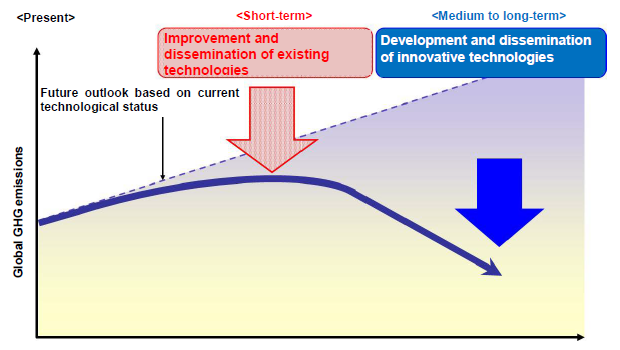 In terms of developing innovative technologies, the Government must make a concerted effort to ensure the promotion of measures identified in the Innovation Plan for Environmental Energy Technology and the Program for Strategic Innovative Energy Saving Technology, and make sure that such efforts are properly evaluated under the international framework. Furthermore, it is essential to advocate the importance of innovation to the international society through such activities as ICEF. In addition, it is important to compile worldwide information on technological innovations, and suggest to utilize them in UN climate change negotiations or international reviews of each countries' targets. Global warming countermeasures should set a high value on the establishment of conditions in which corporate vitality can be fully enhanced. This will promote the development and dissemination of low-carbon technologies and products in good balance with economic growth, the maintenance and enhancement of international competitiveness and securing employment. Furthermore, in light of the fact that GHG emissions are relevant to peoples living as a whole, emission reductions should be addressed not only by the business community but also by the entire general public. From this perspective, public campaigns to raise awareness are extremely important and should be fundamentally enhanced. The challenges faced by Japan are not limited to addressing global warming but are diversified across various issues; improving the quality of peoples' living amid the advancement of an aging society with a low birthrate, and achieving economic growth in the midst of economic globalization. In order to address a large number of challenges with limited resources and achieve maximum effects, the Government should appropriately streamline projects by excluding duplicative measures implemented by different ministries and agencies#4 and attach priority to cost-effective measures that will also serve the purpose of achieving other policy aims. Improving the quality of housing, buildings and transportation systems fall under those aims. In order to set up a responsible target for 2030, the Japanese government should not take a top-down approach and set a groundless target. With due consideration of the "3E's+S," Japan should formulate a well-balanced energy mix that will underpin its growth strategy, and then compile each measures without casting too much cost. In addition, international equity, feasibility and the appropriateness of the public burden should be ensured. In particular, in terms of international equity, reduction rates from specific baseline years such as 1990 results in inequity, and thus should not be adopted. Furthermore, the inclusion of overseas credits can have many negative ramifications, and thus targets should be set up based on "real" emissions#5. Proactive efforts of the business community have successfully yielded significant results to date. It has also proved the effectiveness of the pledge and review approach, which has been adopted in climate change negotiations. The Government should adopt Keidanren's Commitment to a Low Carbon Society as its central policy, and encourage its implementation by enhancing government support for the development and introduction of energy-saving technologies and products. Such supportive measures will strengthen international competitiveness of Japanese industry. Cap and trade style emission trading schemes, the carbon tax, and the current feed-in-tariff scheme for renewable energy all hinder lifecycle-oriented efforts and the development of innovative technology by the business community. Programs that have already been introduced should be fundamentally reviewed. Moreover, revenue from the Tax for Climate Change Mitigation should not be used for wider purposes beyond mitigating energy-related CO2 emissions#6. After the Great East Japan Earthquake, the emission factor for electricity rose drastically due to the stoppage of nuclear power plants, and Japan recorded 1 billion 395 million tons (provisional estimate) of emissions in 2013, marking a record high. In light of the fact that nuclear energy, which does not emit CO2 during electric power generation, will play an important role, Japan should make maximum use of nuclear energy based on the premise of securing safety. Fossil fuels will also continue to be an essential energy source underpinning peoples' lives and business operations. Thus it is important that they are effectively utilized while efforts are made in pursuit of higher efficiency. On renewable energy, including solar power, wind power and biomass, research and development should be promoted to resolve the challenges of low efficiency, unstable output and high costs, and should be introduced thereafter. It should be noted that thermal power is required to balance the variable output of renewable energy systems, and thus harnessing renewable energy does not always lead to the reduction of carbon dioxide emissions and continuing the introduction of renewable energy in the manner it is promoted today will increase public burden to a great extent. In order to implement global warming countermeasures successfully in the household sector, where emissions are increasing, public campaigns should be enhanced drastically. Therefore, ambitious targets must be set up for public campaigns, including those addressing individual issues, such as the "Cool Biz" and "Warm Biz" campaigns, replacing existing products with energy-saving products, and the "Eco-Drive" campaign, and initiatives led by the national and local governments. The promotion of such campaigns should be ensured by establishing a PDCA cycle and conducting follow-ups on the progress at the joint meetings of the Industrial Structure Council and Central Environment Councils. Moreover, from the viewpoint of making a concerted effort to implement public campaigns, the Government should promote proactive efforts by establishing a Conference on the Promotion of Public Campaigns (tentative name) led by the Prime Minister, that will involve all ministries, local governments, the business community and NGOs. It will also be important for the public sector to take the initiative in promoting public campaigns. The public sector, including the national and local governments, should make more efforts to promote the Cool Biz and Warm Biz campaigns in government office buildings, introduce energy-saving equipment, and renovate government office buildings, etc., without imposing additional burdens on the general public, and by reallocating budgets in which duplicative and wasteful spending have been identified. Moreover, exemplary undertakings are expected by organizations to which opinion leaders engaged in critical policy discussions in Government councils belong to; academic organizations, professional organizations, labor organizations and incorporated administrative agencies. As a measure for "strengthened co-operation with consumers, customers, and other interested groups," one of the four key pillars of Keidanren's Commitment to a Low Carbon Society, the business community will promote the dissemination of energy-saving products and high-performance material that will contribute to the reduction of emissions through products' lifecycle, including the end-use and consumption phases. With the participation of the transportation sector as well as the commercial and other sectors, the business community is determined to promote global warming countermeasures in various fields. In order to realize emission potential in the residential and transportation sectors, in addition to the each industry's action, it will be important to improve social infrastructure, including housing and buildings, transportation systems, etc. The INDC targets 2030 which address long-term efforts, so it is a good opportunity to fundamentally improve social infrastructure. Moreover, the dissemination of high-quality housing and buildings and the development of advanced transportation infrastructure, including intelligent transportation systems (ITS), will serve to improve health, amenity and other qualities of life and to prevent traffic accidents and avoid economic loss due to traffic congestion. Hence, measures taken in these areas will cost-effectively lead to the achievement of other policy objectives. Therefore, implementation of measures in these areas are important. Furthermore, in order to ensure effectiveness, the Government should formulate a roadmap of actions through 2030. Ministry of Economy, Trade and Industry, the Ministry of the Environment, the Ministry of Land, Infrastructure and Transport, the National Police Agency, and other relevant ministries should join hands with local governments to formulate detailed policy measures, set up targets on each measures' effects, and ensure their implementation by conducting the PDCA cycle. It is important to implement not only mitigation measures that seek to reduce emissions, but also adaptation measures to respond to inevitable impacts. Climate change is caused not only by human-induced greenhouse gases but also by natural factors, and the government has implemented various measures based on their respective expertise. It is impossible to implement measures that address only climate change induced by human activity. Drawing on the expertise held by each ministry and agency, necessary measures should be implemented in the fields of disaster response, agriculture, forestry and fisheries, and health care, considering adaptation. In that sense, adaptation measures respond to "environmental change" caused by climate change, and are not the equivalent of "environmental conservation" measures. Moreover, there is an incentive for the people and business to implement adaptation measures, and imposing legal obligations to them would constitute excessive regulation. At the same time, it would be extremely inappropriate to obligate the people and business to cooperate with other actors in their adaptation efforts, as such measures would, in effect, compel parties that are not the direct causers of a phenomenon to shoulder the responsibilities related to it. From the viewpoint of evaluating past reduction efforts properly, the costs required to achieve targets (marginal abatement costs, average abatement costs) should be highlighted. Ensuring equity in abatement costs across both developed and developing countries will lead to avoiding carbon leakage and securing equal footing. Moreover, since total domestic emissions are dependent on industrial structure, it is important to compare not only energy consumption levels and CO2 emissions per unit GDP or per capita, but also energy efficiency levels of each sector. Reduction rates relative to specific baseline years are not appropriate indices for the consideration of international equity; they do not reflect reduction efforts prior to the baseline year, and it would be impossible to establish a specific baseline year that is fair to all countries. If Japan's quantitative target is to be given as a reduction rate from a certain baseline year, then the baseline year should be as recent as possible, so that future reduction efforts can be presented. It should be noted that adopting 1990 as the baseline year entails the major problem that Japan's efforts after the oil crises are not reflected and that the continuity of Japan's energy supply structure ended in the Great East Japan Earthquake. In the past, Japanese government estimated the progress in energy savings and the amount of renewable energy excessively. These estimates should be reviewed to be more realistic. In terms of energy savings, the business community will promote the Keidanren Commitment to a Low Carbon Society and implement measures to the maximum extent possible while ensuring economic efficiency. Estimates of future energy demand in each industry should be based on the Keidanren Commitment to a Low Carbon Society. The total costs required for climate change countermeasures should be presented in order to ensure accountability regarding they impose public burden. In addition to costs related to the promotion of energy savings and the introduction of renewable energy, balance them with other critical issues imposing public burden, such as the establishment of sustainable social security scheme, should be considered. During the first commitment period of the Kyoto Protocol, in which Japan's target was set on a top-down approach, large amounts of national wealth flowed out of Japan to purchase foreign credits. However, the post-2020 framework takes a bottom-up approach, and each country establishes reduction targets by themselves. The same mistake should not be repeated by including foreign credits in the national target. Concerns have been raised that if the Government assumes the financial costs to procure credits through the Bilateral Offset Mechanism, an immense amount of public burden will be generated. Decisions are yet to be made regarding how overseas credits and those generated under the Bilateral Offset Mechanism will be addressed, including the most basic issue of whether double-counting (adding emissions to the host country when credits generated in a project are transferred internationally) will be allowed. In particular, under the Bilateral Offset Mechanism, it depends on the partner country whether or not credits will actually be issued and transferred. Including such uncertain credits to the target would not constitute the responsible behavior of a government. The EU and the US have already stated their intentions not to use overseas credits to achieve their targets. Counting credits in Japan's target in this situation would arouse international concerns regarding Japan's attitude towards actual emission reduction. Incorporating credits into the national target will invite the risk of having no choice but to admit unreasonable conditions in advancing Bilateral Offset Mecchnism projects. Moreover, if Japan comes to be viewed as a leading credit buyer, it may face unnecessary risks in international negotiations and in credit procurement. (2) In order to promote Japan's contribution on a global scale, it is important to advocate to the international society that emission reductions achieved in projects implemented on a business basis are Japanese companies' contributions. Bilateral Offset Mechanism projects should also be used as effective instruments, maintaining their financial sustainability by providing government support only during the design and demonstration phases. The following proposal is included in the negotiation text providing the contentions and proposals made by each country on a post-2020 international framework: "Acknowledging that carbon pricing is a key approach for cost-effectiveness of the cuts in global greenhouse gas emissions, "
The effects of carbon pricing are diversified depending on national circumstances and policy design. The Fifth Assessment Report of the Intergovernmental Panel on Climate Change (IPCC) also concludes as follows: "In principle, mechanisms that set a carbon price, including cap and trade systems and carbon taxes, can achieve mitigation in a cost-effective way, but have been implemented with diverse effects due in part to national circumstances as well as policy design." The global warming potential (GWP) is a relative measure that allows the comparison of the global warming effect of each gas relative to that of carbon dioxide (CO2). For example, the GWP of CFCs, which are not included in the Kyoto Protocol, is 3,800 - 8,100 and the GWP of HCFCs is 90 - 1,800. Detailed approaches can be found in "Approaches towards overseas credits under the Intended Nationally Determined Contribution" (page 10). The use of revenue from the Tax for Climate Change Mitigation was limited to measures to mitigate energy-related CO2 emissions upon its introduction and this background must be respected. Moreover, it is inappropriate to compel a specific groups of citizens, such as fossil fuel users, to shoulder the costs of forest and biodiversity conservation and mitigation, which deliver various benefits across society.